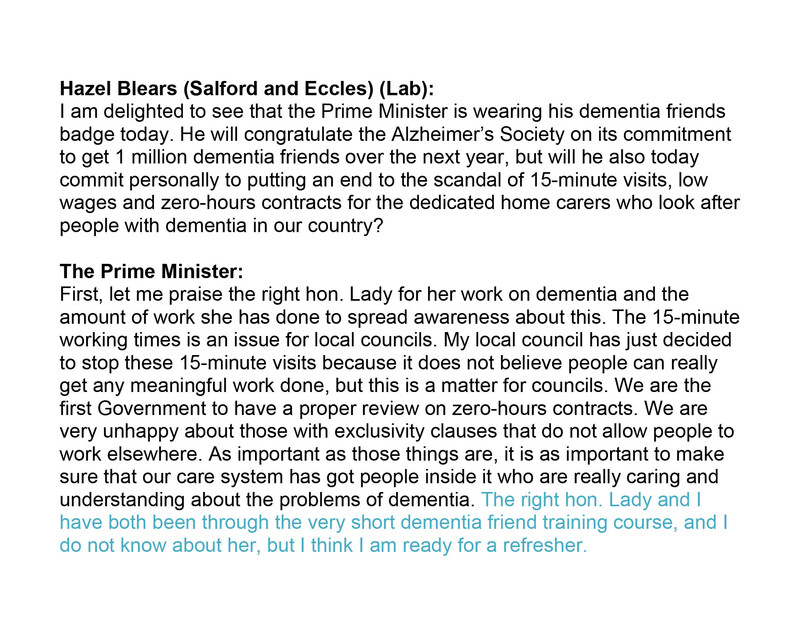 Dementia was mentioned twice today in Prime Minister’s Questions. There was a ‘big announcement’ today from the Alzheimer’s Society which could have been used to convey the meaning of how people living with dementia could be encouraged to live well in productive lives. As part of this publicity, Terry Pratchett was pictured holding up a placade saying, “It’s possible to live well with dementia and write bestsellers “like what I do””. Paul Burstow MP brought up the first question specifically around this initiative. The answer fails spectacularly to address the issue of living well with dementia, but is a brilliant marketing shill for ‘Dementia Friends’. There’s no attempt to include any other charity working in dementia. It doesn’t mention the C word either – Carers. And then it was left up to Hazel Blears MP to provide another question on dementia. This time it’s a bit different. There’s no answer on how zero hours contracts cannot specifically in the care system promote living well for either carers (including unpaid careworkers) or persons with dementia. But it’s exactly the same otherwise. A brilliant marketing shill for Dementia Friends, and no mention of any other charity working on dementia. 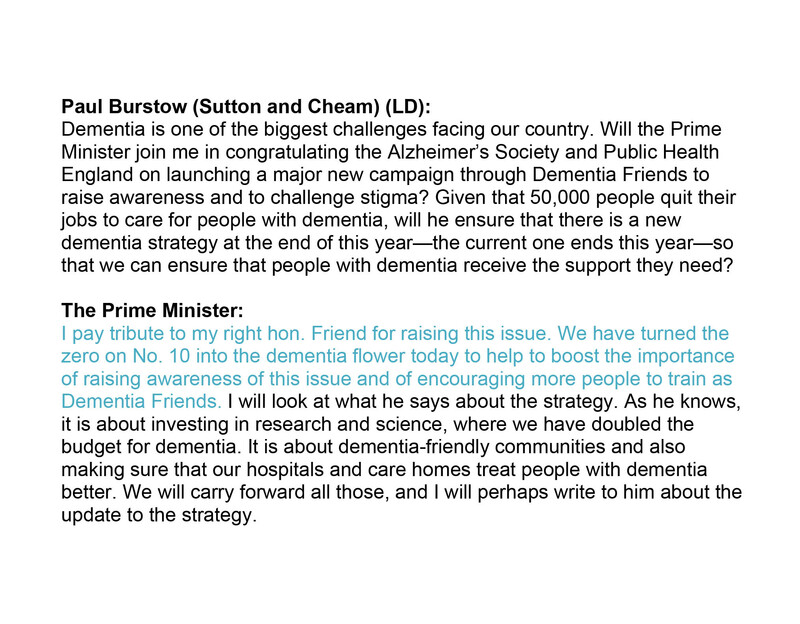 Quite incredibly here, Cameron produces an answer on ‘caring’ in dementia without mentioning carers or careworkers. With Ed Miliband, Ed Miliband and David Cameron all wearing their ‘Dementia Friends’ badges, is it any wonder you never hear about Dementia UK’s Admiral Nurses any more? There is undoubtedly a rôle for all players in a plural vibrant community, but this should never have been allowed to become an ‘either’/’or’ situation. which causes grave concerns ,for the “service users”,as to “who will be coming next time”, “will they understand,my needs” and “will I get on with them”,all serious concerns,for vulnerable people and constant changes in care personal, make errors of care ,inevitable. “Personal Care” is a traumatic experience,at the best of times and,the adverse affects of “ZHC’s make them “UNFIT FOR PURPOSE”.The Government MUST put compassion before politics ,on this occasion and “Withdraw It From Use,in Social Care”!